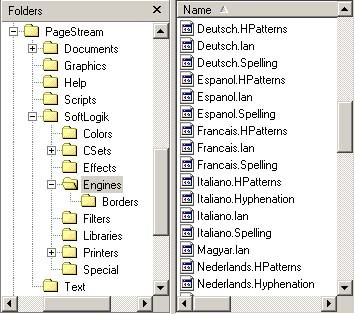 If you take a quick peek in PageStream, you will see a number of languages listed in the Language submenu in the Type menu. These represent languages for which PageStream has a spelling dictionary, hyphenation routines, and provisions for language specific date, time and smart quotes. A few other things like index topics are also controlled by the language of the text. If you look in the SoftLogik folder, you will see a folder named Engines. Inside that folder are a number of files. Each language has a .language module, a .Spelling dictionary file, a .HPatterns file that contains the rules for hyphenating text, and a .Hyphenation file that lists exceptions to the hyphenation rules. You may also find .UserSpelling and .UserHyphenation files that includes words that have been added by you. If you are looking to free up a few megabytes of hard drive space, or reduce the memory used by PageStream, you can delete out the languages that you are likely to never use. The dictionaries themselves are not loaded unless you actually use them, but the language modules do add up in a tight memory situation. So how do you specify the language to use? 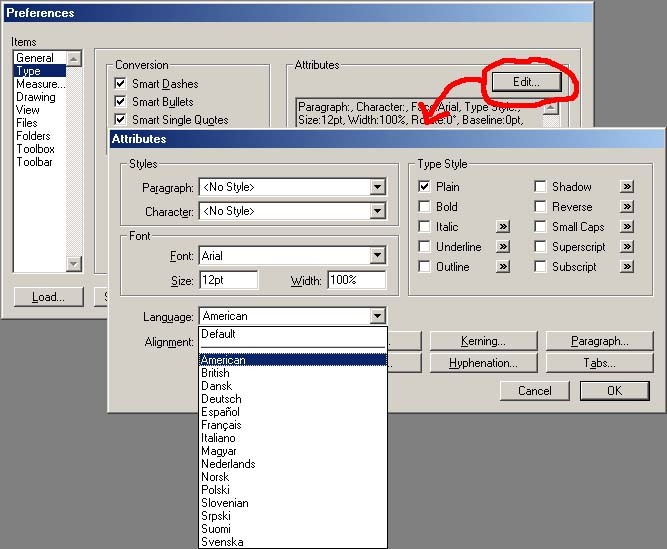 The most practical way is to set the default language of all text created in PageStream to the language of choice. This can be set in the Type panel of the Preferences dialog box. Select Edit to open the Attributes dialog box. Choose the language from the Language popup menu. Select OK, then Save. Any future documents created will now default to that language for text functions. However, existing documents will not change. After all, those where created with a different language set for them. To change the text language for an existing documents can be done by using the Find and Change Attributes dialog box in the Edit menu. To change a short section of your text to another language (say you are creating a bilingual document), highlighting the text with the text cursor and choose a language from the Language submenu in the Type menu. Now when you spell check, PageStream will automatically switch between the proper dictionaries. When you are spell checking, PageStream will look each word up in the language that it is specified in, but if it is misspelled you can check the word in another dictionary. Just remember that PageStream will revert back to the text language for the next word. 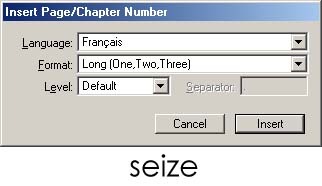 If PageStream keeps trying to look up the word in the American dictionary, but the text is really written in French, don't fight PageStream with each word. Just change the text language to French as outlined above! 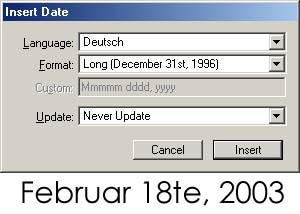 Last but not least; Auto Hyphenation, Insert Date, Insert Time, and Insert Page Numbers all allow a language to be specified for that command that overrides the text language. Most likely you are better off changing the language of the text than to specify it for each variable.